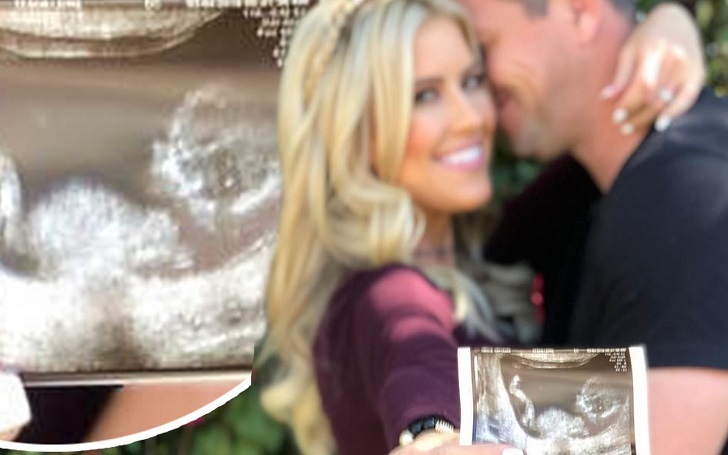 Baby on board for Christina El Moussa and Ant Anstead! It's been three months since the Flip or Flop star married her loving boyfriend and the couple is now expecting their first child together. Television personality, 35, took to Instagram on Friday, March 22, to announce her pregnancy. Alongside a photo of the newlyweds holding a sonogram image, she wrote, "@ant_anstead and I are so excited to announce #babyanstead coming this September. She added, "The kids are all so excited to meet their new sibling #5 #Gonnaneedabiggercar." @ant_anstead and I are so excited to announce #babyanstead coming this September!! The kids are all so excited to meet their new sibling #5 #Gonnaneedabiggercar! The television presenter, 39, for his part, shared a collage of the pair's kids from their previous relationships; Amelie, 15, Archie, 12, Taylor, 8, and Brayden, 3, adding a small ultrasound photo at the center. He captioned the post, "And then…… there were FIVE!!! (Well …. four and a half! Will be Five in September)!!" Christina and Ant, who began dating in October 2017 and celebrated their one-year anniversary last October, became married in an intimate wedding ceremony at their home in California. Christina was previously married to Tarek El Moussa for nine years. They tied the knot on April 17, 2009, and parted ways in December 2016.